Why is this important? Beyond the boring and brown shells of the poultry eggs that most of us consume, eggs in the animal kingdom come in an astonishing variety of colors and shapes. This is particularly true in the insect world, where eggs range from a few microns to more than one centimeter in size, come in a bewildering array of shapes, and cover nearly the entire spectrum of visible colors in their hue. Take a look at this National Geographic gallery if you want to check some of these beauties out. Many theories have been proposed over the years to explain the vivid coloration of certain bird and insect eggs – the colors have been shown to aid in camouflage, warn off predators, and in certain cases, even act as a social signaling system. While many species display characteristic egg coloration patterns, a lot of internal variation also exists between individuals within a species. 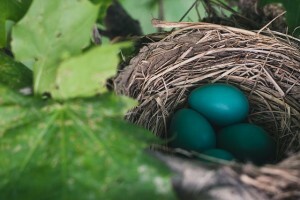 In case of birds like pied flycatchers and eastern bluebirds, age and physical fitness of the egg-laying female has been shown to correlate strongly with the color of the eggs. However, until recently, no evidence existed to suggest that females can themselves control the color of their eggs. Enter the spined soldier bug, Podisus maculiventris. 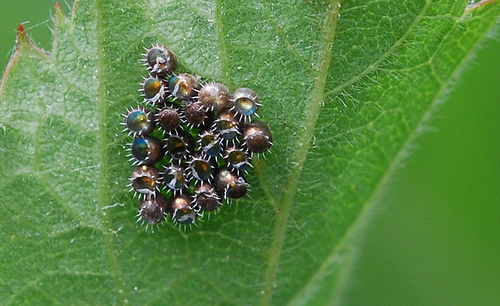 Like many other insects, the spined soldier bug lays its eggs on leaf surfaces, laying about 17-70 eggs at one time. The eggs range in color from a very light, pale white, to a dark brownish-black. Since the same females can lay both kinds of eggs, Paul Abram, a PhD student, and his colleagues at the University of Montreal, Canada decided to find out what conditions determined the color of egg laid. They were rewarded by the observation that the lighter eggs were laid almost exclusively on the lower side of leaves, while darker eggs were laid on the upper side. When the insects were put on covered petri dishes in the laboratory, the female bugs laid lighter eggs on the underside of the lid of the dishes (probably corresponding to the lower side of leaves), while darker eggs were laid on the bottom of the dishes. Over a leaf, or under? The upper and lower surfaces of leaves each provide distinct advantages and drawbacks to egg-laying animals. The underside of leaves provides slightly better shelter from the elements like the sun and wind, reducing the risk of overheating or desiccation. But the lower side also attracts more predators, to whom these eggs provide an easy and tasty meal. The upper side has fewer predators, but is more exposed to the elements. A strategy, therefore, can be diversification, i.e. laying eggs on both surfaces, and this could be hypothesized to aid maximum survival of the stick insect offspring. 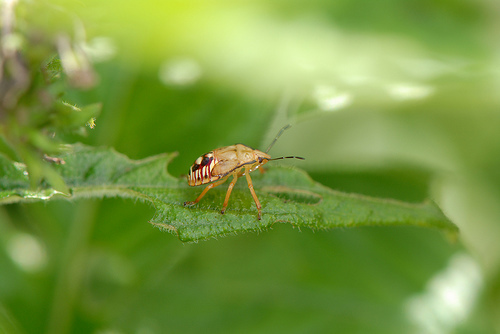 In the case of the spined soldier bug, the separation of egg coloration across the two sides suggests a functional role being played by the color or the pigment imparting the color. Abram and colleagues came up with an interesting hypothesis – the upper surface, among other things, is more exposed to the damaging rays of the sun. Could the darker colors of these eggs play a protective role in this context? Indeed, upon testing light and dark eggs for UV resistance, the researchers found that embryos from darker eggs were much better protected against UV radiation, and tended to survive better when exposed to increasing doses of UV radiation. In order to find an example of a dark pigment conferring UV resistance in nature, we don’t need to go far. Melanin, the pigment primarily responsible for the variation of skin color in human beings, is widely prevalent throughout the animal kingdom, and provides protection against ultraviolet radiations. Surprisingly, upon checking the dark eggs for the presence of pigments, the amount of melanin was found to be negligible. What, then, is the mystery pigment responsible for the egg color? Well, no one knows, and future studies will hopefully, solve this mystery. Fact: Paul Abram, the lead researcher in the above story was inspired to investigate egg colours by observing that the stink bugs laid differently coloured eggs on differently coloured squares of a newspaper crossword puzzle that underlined the bottom of a cage. There could be two ways in which this selective laying of differently colored eggs takes place. The eggs themselves could form pigments in response to UV radiation or other cues, or the female bugs could choose which kind of eggs to lay in response to when or where it is laying them. By using varying conditions of light and radiation, the authors demonstrated that the pattern of egg laying on leaves was remarkably constant irrespective of the ambient light and radiation. This suggested that females controlled the type of eggs laid using the physical nature of the substrate as the primary cue. The selective control of egg color in this study fits neatly into the list of the several ways in which organisms do their best to ensure survival of their offspring, taking into account the unpredictable nature of the environment in which they would be born. 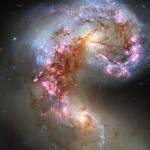 And in such small bits and steps, evolution strides forward.